South Korea occupies the southern half of the Korea Peninsula, which extends about 1,000 km (about 620 mi) southward from northeastern China. The total area of South Korea is 99,268 sq km (38,328 sq mi), including about 3,000 islands. South Korea is a mountainous country. Lowlands, located primarily in the west and southeast, constitute only 30 percent of the total land area. South Korea can be divided into three general regions: an eastern region of high mountain ranges and narrow coastal plains; a western region of broad coastal plains, river basins, and rolling hills; and a southern region, where a maze of mountains and valleys in the west contrasts with the broad basin of the Nakdong River in the southeast. Halla-san, an extinct volcano that forms Jeju Island, is the country's highest point at 1,950 m (6,398 ft). Jeju Island is located about 100 km (about 60 mi) off the southern coast of South Korea. It is the country's largest island, with an area of 1,845 sq km (712 sq mi). The Taebaek range forms the country's principal mountain system. It extends in a generally north-south direction parallel to the eastern coast. Four other mountain ranges extend from the Taebaek range, including the Sobaek range, the country's second largest mountain system. The Sobaek range branches southwestward from the Taebaek range, dividing the southern part of the country. The highest peak of the mainland, Jiri-san (1,915 m/6,283 ft), rises in the southern portion of the Sobaek range. The mountain ranges of the mainland formed through geologic folding, in contrast to the volcanic origin of Halla-san. The mainland has no volcanic activity, and earthquakes are rare. 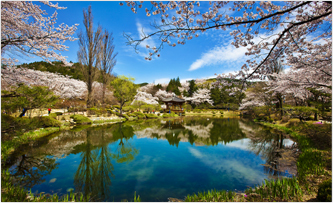 South Korea has a temperate climate, with four distinct seasons. Winters are cold and windy, and snow falls in all but the southernmost regions. Summers are hot, humid, and rainy. The weather in South Korea is affected by the Asian continent and the surrounding seas. The Asian monsoon (large-scale wind systems that reverse direction seasonally) brings frigid air from the Arctic in winter and warm, moisture-laden air from the South China Sea in summer. In Seoul the average January temperature range is -7° to 1°C (19° to 33°F), and the average July temperature range is 22° to 29°C (71° to 83°F). Winter temperatures are higher along the southern coast and considerably lower in the mountainous interior. The average annual precipitation in Seoul is 1,370 mm (54 in), and in Busan it is 1,470 mm (58 in). 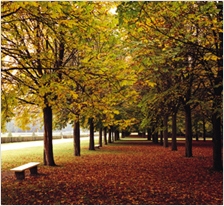 Rainfall is concentrated in the summer months (June to September). The southern coast is subject to late summer typhoons that bring strong winds and heavy rains.